While technical analysis may seem like a space-age discipline, it’s actually been around for a lot longer than you might think. In fact, the Japanese were doing it back in the 17th century, inventing one of the most insightful charting techniques – candlestick charts – in the process. This technique was first developed sometime after 1850 by a Japanese rice trader called Homma from the town of Sakata. 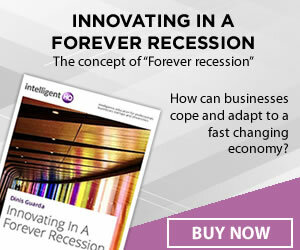 Over time, it was developed and refined, most notably by Wall Street Journal founder Charles Dow around 1900, into the techniques we use to analyse the financial markets today. Before you can create a candlestick chart, you need to know the open, high, low, and close values for the time period that you wish to represent. The rectangular part of the candlestick is referred to as ‘the body’ or sometimes ‘the real body’ The thin lines above and below the body, known as ‘shadows’, ‘wicks’, and ‘tails’ represent the high/low range, with the top of the upper shadow representing the high and the bottom of the lower shadow representing the low. A diagram showing what the different parts of a candlestick formation represent. If the closing price is higher than the opening price, a hollow candlestick is drawn, with the opening price being represented by the bottom of the body and the closing price being represented by the top of the body. If the closing price is lower than the opening price, a filled candlestick is drawn, with the opening price being the top of the body and the closing price being the bottom of the body. Candlestick charts are often preferred to traditional bar charts by traders, as they tend to be much easier to interpret, and they look a bit nicer as well. By looking at a candlestick, a trader can quickly gain a picture of the price action for that time period, and compare the relationships between the open and close and the high and the low. In particular, it is the relationship between the open and close that is of most immediate use, with hollow candlesticks (close greater than open) showing buying pressure and filled candlesticks (open greater than close) showing selling pressure. As a general rule, longer bodies indicate more intense buying or selling pressure, while short bodies indicate that there hasn’t been much price movement, and that consolidation has taken place. If you see a long hollow candlestick, it indicates strong buying pressure, and the longer it is, the further the close was above the open. This shows that prices increased strongly from open to close, and that the buyers were aggressive. Although these are often taken to be bullish indicators, you have to take the bigger picture into account. For example, a long hollow candlestick might indicate a turning point or a support level if it occurs after an extended decline. Conversely, if you see one after a long advance, it could indicate that bullishness has become excessive, and a correction is on the way. A long filled candlestick indicates a strong selling pressure, and the longer it is, the further the close was below the open. This shows that sellers were aggressive, and that prices fell significantly from open to close. Again, what this shows you depends on the context. A long filled candlestick after a big advance can mark a turning point or a resistance level, whereas if you see one after a long decline, it can indicate market panic or the beginning of a price collapse. 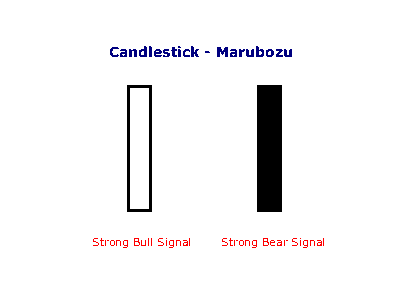 Sometimes, candlesticks do not have shadows, and these are called Marubozu candlesticks. These occur when the opening and closing prices are equivalent to the relevant highs and lows. A hollow Marubozu is a strong bullish indicator that forms when the the open equals the low and the close equals the high, showing that buyers controlled the price action from the open to the close. A filled Marubozu is a strong bearish indicator that is formed when the open equals the high and the close equals the low, and these indicate that sellers controlled the price action from the open to the close. The shadows on candlesticks provide useful information about the time period under scrutiny, with upper shadows representing the session high and lower shadows representing the session low. 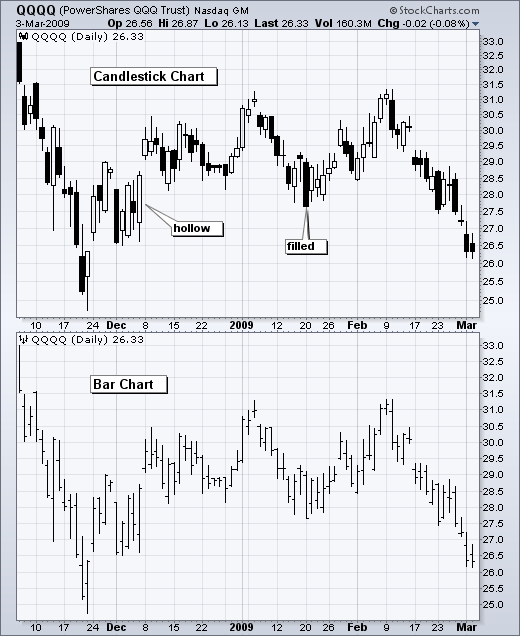 If a candlestick has short shadows, it indicates that most of the price action occurred between the open and the close. A long shadow indicates that the price fluctuated well beyond the open and close values during the session. A long upper shadow and a short lower shadow shows that buyers dominated the session, bidding prices higher, but that sellers later forced down these high prices. By the same token, candlesticks with short upper shadows and long lower shadows show that sellers dominated the session, driving prices lower, but that buyers emerged later in the session to drive the price back up. A candlestick with long shadows on either end and a small body are known as ‘spinning tops’. Whereas having one long shadow indicates a reversal, spinning tops represent indecision in the market. The small body shows that there wasn’t much overall movement between the open and the close, while the long shadows indicate that the price fluctuated widely during the session, which means that both bulls and bears were active between open and close. With neither buyers or sellers gaining the upper hand, the result is a standoff. A spinning top after a long hollow candlestick or a long advance shows weakness among the bulls and an interruption in the trend. Similarly, a spinning top after a long filled candlestick or a long decline shows weakness among the bears and an interruption in trend or possible change.